In early adjuvant breast cancer trial reports, aromatase inhibitors more effectively reduced breast recurrence with lower risk of thromboembolic events and endometrial cancer than tamoxifen, while aromatase inhibitors had higher fracture and cardiovascular disease risk. We used data from updated patient-level meta-analyses of adjuvant trials in analyses to summarize the benefits and risks of these agents in various clinical circumstances. Baseline incidence rates for health outcomes by age and race/ethnicity, absent aromatase inhibitor, or tamoxifen use were estimated from the Women’s Health Initiative. Aromatase inhibitor and tamoxifen effects on distant recurrence were obtained from a meta-analysis of the Arimidex, Tamoxifen, Alone or in Combination (ATAC) and Breast International Group (Big-1-98) clinical trials. Impact on other health outcomes were obtained from meta-analyses of randomized trials comparing aromatase inhibitor to tamoxifen use and from placebo-controlled chemoprevention trials. All health outcomes were given equal weight when modeling net benefit/risk for aromatase inhibitor compared to tamoxifen use by breast cancer recurrence risk, age (decade), race/ethnicity, hysterectomy (yes/no), and by prior myocardial infarction. 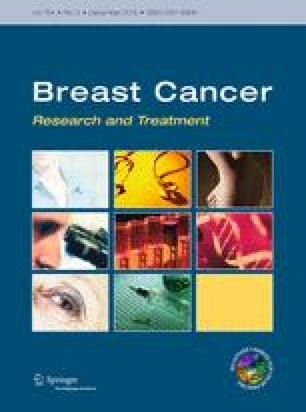 Over a 10-year period, the benefit/risk index was more favorable for aromatase inhibitor than for tamoxifen as adjuvant breast cancer therapy in almost all circumstances regardless of patient age, race/ethnicity, breast cancer recurrence risk, or presence or absence of a uterus. Only in older women with prior myocardial infarction and low recurrence risk was an advantage for tamoxifen seen. Using a benefit/risk index for endocrine adjuvant breast cancer therapy in postmenopausal women, benefit was higher for aromatase inhibitor use in almost all circumstances. The online version of this article (doi: 10.1007/s10549-015-3647-1) contains supplementary material, which is available to authorized users. We acknowledge the dedicated efforts of investigators and staff at the Women’s Health Initiative (WHI) clinical centres, the WHI Clinical Coordinating Center, and the National Heart, Lung and Blood program office (listing available at http://www.whi.org). We also recognize the WHI participants for their extraordinary commitment to the WHI programme. The WHI programme was funded by the National Heart, Lung and Blood Institute, National Institutes of Health, Department of Health and Human Services through contracts N01WH22110, 24152, 32100-2, 32105-6, 32108-9, 32111-13, 32115, 32118-32119, 32122, 42107-26, 42129-32, and 44221. Additional funding support was provided by Kaiser Permanente Southern California award #13RHAqu-02-UCLA. RTC has received speaker’s fees and honorarium from Novartis and Genetech; honorarium for advisory boards and consulting for Novartis, Astra-Zeneca, Pfizer, Novo-Nordisk, Genentech, Genomic Health, and Amgen. No other author has conflicts to declare.